There is a handful of handsome 18-hole layouts and over a dozen delightful 9-hole circuits spread out among the Fijian islands. 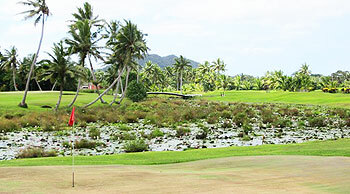 One of the best of all these exotic courses is found at the Pearl South Pacific Fiji Resort, designed by American architects Robert Trent Jones Jr. and Gary Roger Baird. The layout, extending to just less than 7,000 yards, lies on the southern coast of Vita Levu and its esteemed design team managed to incorporate water hazards into no fewer than twelve of the eighteen holes on the scorecard. Pacific Harbour hosted the World Amateur Championships the year after it opened, in 1978, when the American four-man group of Bobby Clampett, John Cook, Scott Hoch and Jay Sigel held off nearest challengers Canada to claim the Eisenhower Trophy. I've had a few days to think about this one and I'm still not sure which way to go: Is this a course trading on past glories but actually pretty average these days, or is it a tropical course that is good value for money? Maybe because I played Natadola Bay the day before I couldn't appreciate this course enough, but it's just a little rough around edges. Some parts are a little overgrown and the greens appeared to have died off a little (and had been over sanded), but there were plenty of ground staff about - actually, there were more groundskeepers than other players on the course. On the positive side, the design was interesting and the holes though the jungle areas were peaceful and were interestingly different. The round cost FJD45 which is excellent value for 18 holes. The feature holes were the 6th par 5 along the jungle, the 8th a par 3 over a lake and the 16th which runs along the river.